Doctor Who: Big Finish - LAST OF THE CYBERMEN Review | Warped Factor - Words in the Key of Geek. Tony Fyler stares vacantly into space for two hours. 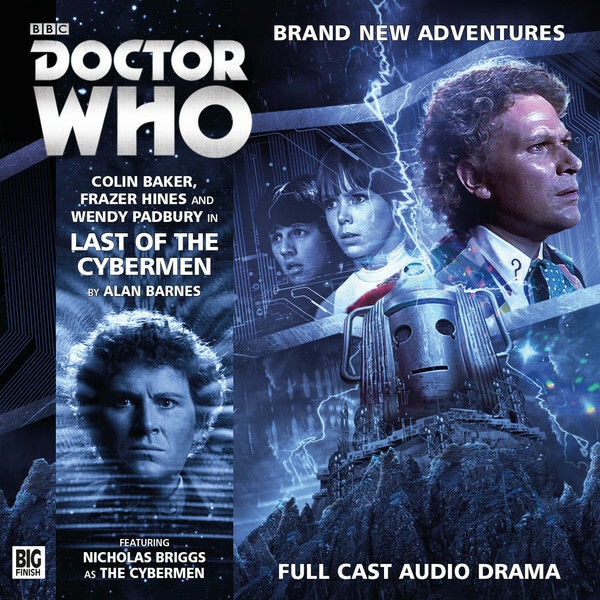 Last of the Cybermen packs a lot of promise into its title. Then it adds the attraction of reuniting Colin Baker’s Sixth Doctor with Second Doctor companions Jamie and Zoe (they were together as a team in Legend of the Cybermen, which is about as close as Big Finish has ever come to an acid trip outside of some of the Eighth Doctor’s adventures). The question is whether it can ever hope to deliver on the potential it promises. The story is set just before The War Games – unusually for a Big Finish story, it’s very specific in when it’s set – and the whole ‘Locum Doctor’ thing of later Doctors suddenly being zapped into the place of their earlier incarnations is given very little in the way of plot development, it’s just zap! There you are, deal with it. But once the Sixth Doctor, Jamie and Zoe settle in together, the dynamic is rather fun – Jamie being relentlessly suspicious of the mad-coated bloke in the blond perm until at least episode three, while Zoe accepts almost immediately that this is the Doctor, just not their familiar version. There’s a thread running through the story that, were it made for TV, would have fans weeping, in much the same way as Attack of the Cybermen did, because you really have to know your Who to get the point of some of the plot, which pitches the Cybermen somewhere between The Invasion and Revenge of the Cybermen (even, rather cheekily, throwing in a reason why Revenge Cybermen and their subsequent eighties evolutions were quite so ‘flippant,’ ‘emotional’ and wanting ‘revenge’ in the first place. Very, very cheeky, Alan Barnes. We salute such cheek here at WarpedFactor). The thread brings in a missing cyber-fleet that’s been sitting in hyperspace for ten years waiting for instructions, a bit of the Cyber-war – you get to ‘see’ a Glitter Gun, as mentioned in Revenge of the Cybermen, and even, via a bit of time-twisting, to experience the final attack on Telos that defeated the Cybermen, leaving them, to quote Tom Baker’s Fourth Doctor, ‘just a pathetic bunch of tin soldiers skulking around the galaxy in an ancient spaceship.’ It also brings in Zoe’s backstory, her youth and schooling, Cyber-Planners, from everything from The Invasion to Nightmare In Silver, and the Brotherhood of Logicians that gave rise to Kaftan and Klieg from Tomb of the Cybermen. As I say, it’s reference-rich, this story – and that’s before we start getting into the business of rewriting the timelines, which by episode four requires you to actively listen with your brow furrowed, and ideally a sheet of paper in front of you to keep straight what the hell is going on. All of this with a fairly small cast, and at least a first episode that appears to go nowhere near any of it – although you do get a friendly northern Cyberman, a couple of zombie Cybermen and Cybermats by the maintenance shaftfull to contend with. Besides Colin Baker, Frazer Hines and Wendy Padbury, you have just three other people in this play, which is almost insane given the scope that’s delivered – from a tight first part, by the end of part four, you’re looking at skyfulls of Cyberships, a Cyber-SuperController (another neat allusion making him seem a bit on the chubby side because he’s – ahem – ‘so full of sensors,’ which would explain Michael Kilgariff’s chunky CyberController in Attack of the Cybermen), twisted dimensions, the potential extermination of life on Earth and Telos and maybe, just maybe, the intervention of the Time Lords. That such a scope is rendered with so small a cast is positively breathtaking, but the question really is whether the effort is worth it. Wendy Padbury give solid renditions of their respective companions – not perhaps as one-note as the TV versions demanded of them, but effective in convincing the audience that these people were special enough to be friends of the Doctor’s. Ultimately, Last of the Cybermen is one worth listening to – but you need to take the time out of your busy schedule to fully engage with it if it’s not to slide by you and leave you upside-down and confused as hell. Give it the time and the attention it deserves, and it’s a Colin Baker classic.